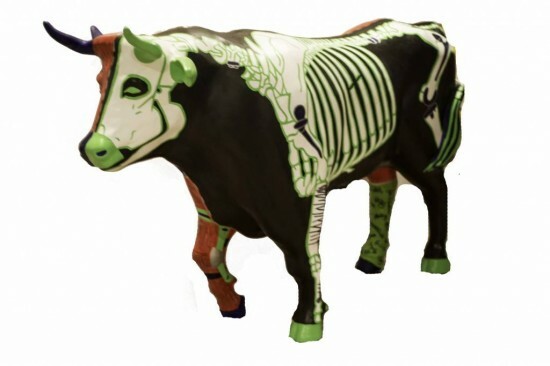 Being both sponsored and employed by Trenton Orthopaedic Group, the design of my ox is an Orthopaedic-inspired two-sided piece; one side displaying the musculoskeletal system and the other side the bone structure of an ox. I wanted my design to display the many procedures and devices an Orthopaedic practice uses to help the human body properly heal. I used paint brushes and acrylic paint to complete the ox as well as a Scotch Cast Plus fiberglass long leg cast with Rust-oleum leak seal flexible rubber coating for extra weather resistance. On the musculoskeletal side I painted a cervical collar and knee brace, which are commonly used to treat muscle ailments, a medical medusa symbol and The Living Orthopaedic Tree. A long leg cast has been applied to Olly’s right hind leg. On the bone structure side I included a few painted Orthopaedic replacement pieces on the shoulder, hip, and knee areas, as well as a few plates and screws to demonstrate some of the many procedures used to mend worn joints and correct broken bones.